Are you experiencing back pain or shoulder pain and you are wondering where it has come from? Well, you are not alone. Studies show that you are among the 85% that experience the same problem in their lifetime. There are various causes for back, shoulder and neck pain but the most common is straining when using a computer. Yes, you are likely to experience pain as a result of using the computer that supposedly makes work more comfortable. The posture you adopt is what brings about this problem. The most convenient way of getting rid of this pain is through a massage. While there are various forms of massage, the best shiatsu massager will work on those problem areas so that you can finally enjoy your evenings. Shiatsu massage is a common term that you probably have come across in various massage literature. Actually, the name is Japanese – just as it sounds. While based on traditional Chinese medicine, the therapy originates from Japan. The fundamental principle behind this treatment is the amplification of the body’s healing mechanisms. In other words, it refers to the process of enhancing the ability of your body to heal itself – interesting? The therapy involves the use of the palm, fingers, and thumbs to apply pressure on various places on the body with the goal of relieving stress, pain and correcting imbalances. The pressure gets rid of the disharmonies and enhances energy flow. Shiatsu also focuses on stretching, as well as, rotating of the pressure points, joints, and limbs. The traditional Chinese medicine refers to these pressure points as meridians and key to the restoration of health. There are 12 meridians that correspond to each primary organ in your body, and they include stomach, large intestine, lung, small intestine, heart, spleen, kidney, bladder, triple heater, heat governor, liver, and gallbladder. In Eastern medicine, the function of these organs has a broader definition. A shiatsu massage will relieve any form of pain, stress, and ailment. It also plays a vital role in promoting your overall health. The therapy has a positive impact on the hormonal, lymphatic and circulatory systems. A massage also helps bring relief to those living with arthritis. If dealing with insomnia, a massage will help in reclaiming your sleep patterns – the healthy one of course. The technique will help in the treatment of bowel trouble, digestive problems, menstrual problems and morning sickness. According to a survey, up to 57 million Americans received a massage, and this underscores its popularity. It is now common for your doctor to recommend a massage following a discussion of its various benefits. Various studies show that massage plays a role in the reduction of blood pressure, enhances blood flow and stimulates the secretion of endorphins. Your body naturally employs endorphins to get rid of pain – the ultimate natural painkillers. Other therapies that have a similarity with shiatsu include physiotherapy, osteopathy, and lymphatic drainage. Unlike their counterparts, shiatsu massage therapists point to illnesses and physical health conditions to imbalances and blockages to your body’s natural flow of energy. This unique perspective differentiates this therapy from in terms of diagnosis and treatment. Shiatsu can be a primary treatment method or complimentary. It combines acupressure and assisted-stretching methods to restore the bone and muscle structure. After a long day at work or working out, you will need a gentle massage to alleviate the pain, tension, and knots in your body. We cannot all afford to go to the masseuse on a frequent basis as that would prove pretty expensive. However, there are massagers out there on the market that offer an excellent service that it almost entirely does away with the need to visit a professional massager. 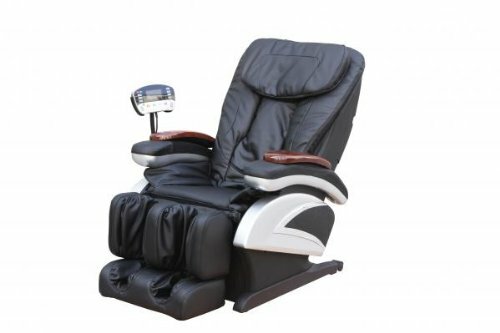 The Electric Full Body Shiatsu Massage Chair Recliner Stretched Foot Rest is one of the best shiatsu massagers that has all the right features for a deeply relaxing massage. The various massage types such as persuasion, compression, shiatsu, kneading and flapping help deal with the problem on body tissues. Another reason to choose this massager is the recliner providing optimum comfort. You don’t have to do anything as the massage chair works for you efficiently. The product also has a display through which you keep track of various activities and make the necessary changes if need be. This is one of the best shiatsu massagers that you will find on the market that incorporates portability and functionality. The massager is in the form of a pillow and will efficiently help you cut on the occasional trips to the masseuses. It is a massager that you can finally lay your head on and get a relaxing and fulfil massage. And when you feel the need to get a pleasurable neck massage just before you go in and present that business proposal, the device has convenient straps that can hold it around the car or office seat. It also carries a good design consistent with neck and back that you feel comfortable using it. The multidirectional nodes provide a relaxing feeling that you probably be looking forward to after a hard day at work. This massage pillow is compact and portable. This means that you can it is the perfect size to through it in your backpack and goes with it wherever you are going – you never know when you may be in need of a relaxing massage. It has leatherette straps that conveniently wrap around the seat and can finally get a relaxing shiatsu neck & back massager. This is when you want a massage just right there in the parking lot in your car. Has an ergonomic design that makes it feel comfortable on your neck and other body parts. The goal of any massager is to make you feel a relaxing sensation and comfort. This device is convenient to use and effectively eliminates any feeling of fatigue and pain. The massager has multidirectional nodes that make you feel like you are getting the massage from the masseuse. It basically feels as if it is the hands of a massager performing their magic on you. This is a truly versatile device as it can work on various parts of your body. Basically, you can use the massager on your neck when you feel like there is tension in there or some strange pain that wasn’t there in the morning. It can also work on your calves and thighs after a workout. The device is also easy to use with adjustable straps and button that needs no instructions to operate. It also comes with a power and car adapter ensuring that you are well ready to receive a good massage whenever, wherever. The combination of the heating function with shiatsu is good. The heating promotes a good circulation for your overall wellbeing. This massager does not have any vibration like some massage pillows in the market. Other pillows like Homedics have the vibration feature that may make it better. 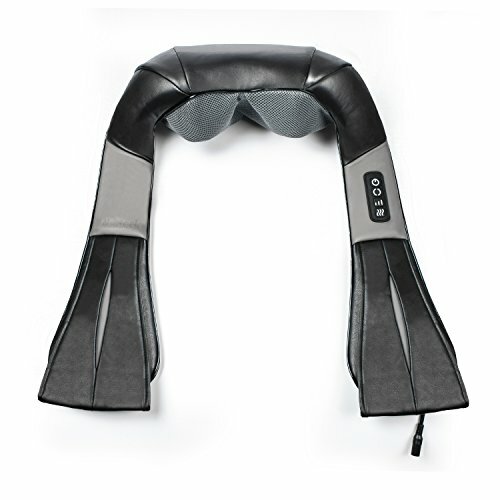 The neck massager is not pretty effective as only centers on the base of your neck leaving the sides almost unattended. This product features in numerous shiatsu foot massager reviews, and it is all for a good reason. 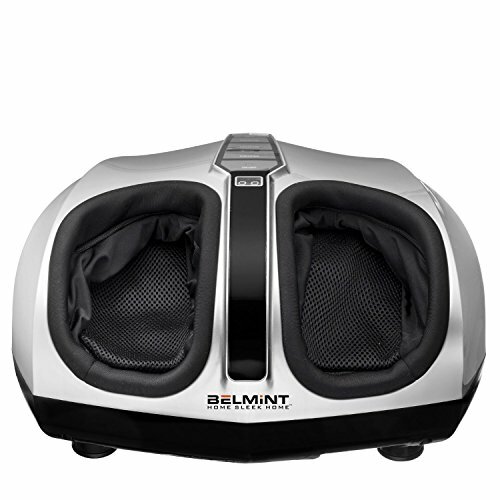 The Belmit Shiatsu massager works on your tired feet after spending the whole day running up and down. It has powerful nodes that work continuously until the fatigue is gone. The first thing you notice about this massager is its compact size. It will not take a lot of precious space in your home. People suffering from diabetic neuropathy, plantar fasciitis, and rheumatoid arthritis will find this device quite a godsend making it one of the best shiatsu massagers. However, this device is not for those with sensitive feet as it can feel a bit strong. It barely touches the arch or the sole of your feet. This device is quite a compact piece. It does not take a significant amount of space as the other devices in the market with more functionality. This device produces a soft rhythmic sound that is not annoying. In fact, some people may not even notice that it is producing any sound. Another thing about this device is its easiness of use. The buttons on the side are quite easy to use that any individual regardless of age or level of education can use it. These buttons are few and have clear instructions that you may not need to seek any guidance from anyone. The massager gives special attention to the soles and toes. It provides a deep-kneading massage to these specific parts of your feet. However, to achieve the best of results, you will need to start with a low setting and increase according to your needs and comfort level. If you are a first time user, hold your horses and start gently – don’t let the excitement overwhelm you. Unfortunately for this device, it does not massage the sides of the heels and the ankles – essential parts of your feet. The top of your foot also receives no service at all. If you are one person that used to get a massage at the spa, you will feel as if you are missing something – yes, parts of your feet. It does not come with easy to follow instructions regarding air pressure. It can oscillate from high intensity to low in a matter of minutes, and this can sometimes catch some people off guard. If you are one of those blessed with large feet, then this massager will feel pretty uncomfortable for you – talk of feeling cramped inside. The machine can especially feel uneasy when the air pressure starts doing its thing. This is a limited edition shiatsu massager designed to give you a relaxing shoulder and neck massager. It has Christmas elements like elks and snow making it the perfect gift for a loved one. It comes with eight nodes that deliver a relaxing massage. 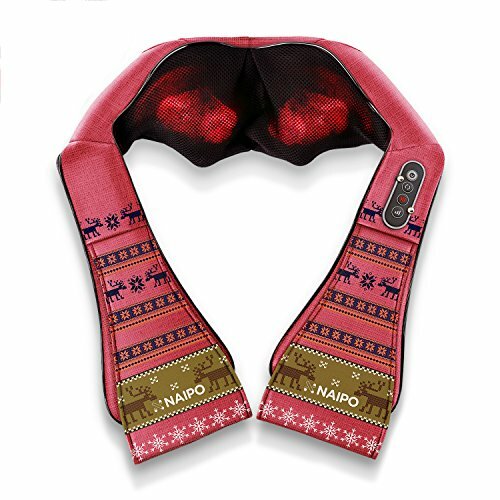 The Naipo massager is quite multifunctional and will not only work on your shoulder and neck but also your thigh, back, and stomach – this is definitely the kind of device you need. You can also share the massager with other members of your family suffering from different pains and ailments. A shiatsu limited edition massager that comes with a Christmas season themes. This is a perfect gift for a loved one that they will never forget. It also comes with a Christmas bag – the perfect to gift someone. There are eight nodes that give a deep shiatsu deep kneading massage to get rid that pain that you may be having on a daily basis. The nodes deliver a fantastic massage that is also comfortable. The advanced heating function that this massager comes with helps deals with any muscle tightness that you may be feeling and also relieves the fatigue in your body accumulated as a result of having a busy day. The neck and shoulder massage have an adjustable intensity. You have the option to choose the speed most appropriate for you. The massage heads are bidirectional and change direction automatically giving you a fulfilling massage – the change of direction feels as if you are receiving the massage from a professional. There is a UL power adapter, and so you can use the massager in your car, at home or even in the office – has a relative portability. This device comes with a dustproof fabric designed to keep it clean. This is a versatile massager as it can comfortably work on any of body part. You can wrap it around your shoulder, stomach neck thigh, and feet. It will deal with leg fatigue, a stiffness of the muscles and neck pains among others. You can also share this device with other members of your home that may be complaining of varied pains and ailments. It also has a decent cord length that makes using it much more straightforward – it is six foot long. The Christmas theme may become boring for some people over time after the festive season is over. The elves, jingle bells and snow imprinted on the massager are not something you can get rid of easily. This massager is not portable as it cannot work without an electric outlet. You cannot use this device when traveling to the remote areas. 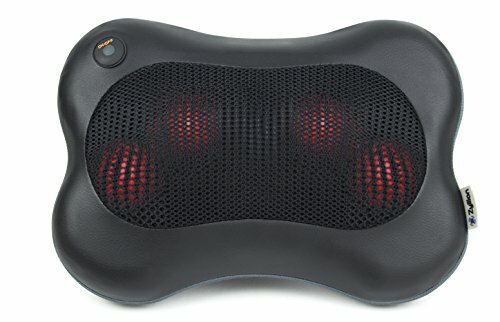 This is one of the best shiatsu massagers that may prove effective when dealing with neck pain and tension as a result of continued computer use – you know how these things are now, you have toiled hard sited and that has negative consequences on your health. This massager also comes with heat for effective tension relief so that you can restore your energy and go back to working hard as you should. The massager is quite beneficial for those people that are just coming from a hard workout. It is also good for those with fibromyalgia or arthritis. It will target the trigger points relieving any tension that may be there so you can finally be your former self. The quality of this massager is not badly off with eight massage heads, and three changeable speed levels. These nodes change direction automatically, and this gives a feeling of being in a massage spa. It automatically shutdowns after 15 minutes, so you are good should you suddenly doze off. This is a pretty versatile massager that not only works on your neck but also your shoulders, neck and almost any place you are feeling tense. It will also work on your thighs, butts, and back – you never know when the pain or tension may decide to hit any part of your body. The heat function on it can relieve the tension on your muscles after jogging all morning to keep fit. It can take its time to get to the right temperature, but it is okay for your body. This unlike some of the other massagers that get too hot over time to be uncomfortable. It easy to use and comes with a car adapter. This means that you can have a massage right there in your car so you can come out feeling refreshed and energized. The buttons are easy to read and use, and so you don’t need to strain so much trying to operate it. The massager is also portable and lightweight. It weighs only three pounds and so can easily throw it inside your backpack and be on your way. This product has an excellent and durable design that line well with your body. It apparently will not come apart after a particular period. You can readily vary the intensity of the massage depending on the amount of power you employ on the leather straps. This is a pretty quiet device that you can use and still read a book or watch television. It will not be irritating to others in the room with you. The downside of this massager is that it is not cordless. You will have to operate near an electrical outlet or in your car to enjoy a relaxing massage. The fifteen minutes shut off feature may be too short for people that would love if the period was longer. Some comparable products can go as long as 20 minutes before they shut off. After going through a busy day at work, your body needs pampering so that you can finally relax and enjoy a good night’s sleep. Most massagers require a lot of input from you, and that makes them seem pretty different from what you would get from a masseuse. The goal here is to make the massage look as real as possible and as close to a professional’s hands as much as possible. The Electric Full Body Shiatsu Massage Chair Recliner Stretched Foot Rest is one quality massager that use to get rid of those sore muscles and tired body. This chair has more than 30 airbags that work on your body adequately – it is a comprehensive head to toe massager. This massage chair increases blood flow, gets rid of stress, loosens those muscles after a long workout and rebalances your physical and emotional wellbeing. The massage chair has various features and massage modes to ensure that you get the best service to restore your energy and relax. The massager has power rollers that move up and down your back for a relaxing massage. This chair utilizes massage heads to reach specific areas of your neck to relieve tension and headache. The massager also makes off flapping to reduce the pains in your muscles and enhance blood circulation removing toxins in the process. This massager also has a kneading feature to deal with the knotted muscles. The fibrous muscles on your spine, shoulder and neck can sometimes need some work to restore your energy and feel all new. Anything that feels like the massager’s hands is deeply relaxing. This massager has chop action tapping that feels like a therapist is working on your back. The feature works on your stiff and sore muscles and removing tension on them. The compression and percussion feature further remove fatigue and stress from your body. The machine uses the latest technology to boost your energy and feel a lot better. It has features that take care of some of the most forgotten body parts. For example, there is vibration and air pressure to deal with your buttocks. There is air pressure on your thighs and calves. Like other latest massagers, this chair has the heat on its rollers that are deeply relaxing. The footrest also has some heat for the calves. The massager has an ergonomic design where the shape and alignment of the rollers easily conform to the shape of your spine. The back range is also extensive and runs from your neck to the tailbone. You will not come across such massagers that cover almost every part of the body. The air massage system is variable, and you can vary it according to your preference. The speed and pressure are also under your control and can adjust them as necessary – talk of control! The automatic recline makes the entire massage process using the chair pretty relaxing and very comfortable. The LED display makes everything so much easy for you. It shows the massage function chosen and the feedback. Compared with similar massage chairs in the market, this is a pretty affordable chair. It balances price and features pretty well. Unlike some other massage chairs on the market, this massager does not have zero-gravity settings. It does not recline fully where the legs go your heart level. This usually is necessary to take the pressure off your spine for a better massage. The customer service is not the best and some customers complain that the manufacturers are unreachable should you need them to resolve a problem you have. It does not foot rollers cater to your feet like the other massagers. However, there is still air pressure and heat to deal with the soles of your feet. For more on this chair, watch this video. The type of massager: there are various types of massagers that can give you a fulfilling massage and the handheld devices are the most common. These handheld are probably the most convenient as you can use one hand to use them. Handhelds operate either on a battery or manual. There also electrical models that you must attach to an electrical outlet in order to use them. There are also the best shiatsu neck massagers that typically come with a soft and comfortable draping around your neck shoulder. These devices are also portable but can either have a cord or be cordless. Pillow massagers are as the name suggests. They are mainly in the form of a pillow, and you can use them on your neck and other places of your body – they are that versatile. Pillow massagers are quite compact, and you can carry them along wherever you go. The Massage Methods: the most recent massagers have shiatsu massage techniques as currently the standard. You will still find other with such procedures as kneading. Consider first what your needs are and then settle on a particular massager. Kneading is best for those people that are into sports and the like as it basically deals with the muscle strain and knots. If you a keep-fit kind of person and often jog or do any other type of exercise, then kneading is a good option as it will provide the necessary relief from pain. You will also find percussion massagers that propel vibrations to your muscles through hammers. In contrast, vibration massager just vibrates on top of your skin acting on the pressure points to get rid of pain adequately. Shiatsu leg massagers are solely for your legs – they can be deep kneading Shiatsu foot massagers using both techniques to deal with pain. Heat: it is not all devices that come with heat. Those that do help your muscle relax by improving blood flow. Of course, you know what an improved flow of blood means for your health. It promotes faster waste elimination and elimination of waste for a quicker healing process. High-end massagers always have heat as an added feature for your neck and shoulders. Heat is also good when it comes to dealing with stress and tired muscles – it provides that extra soothing feeling to forget all the hassles and bustles of making a living. Manual or electric: before you can rush to buy a massager, determine whether you want an electric one or manual. The manual is ideal if you the kind of person that travels a lot. A section of the users is of the opinion that manual massagers are quite efficient in pinpointing the actual areas you are having pain. On their part, electric massagers are apparently more natural to use – all you need to do is switch on a button, and the nodes or ball start rolling while you apply the necessary pressure to the problem area with it. The downside with electrical massager is that you cannot use them in places without power supply. The design and functionality: you will find different kinds of massagers in the market with different designs and functionality. Some will easily go round your neck while others are easier to hold. There are also chairs and pillows, and the most appropriate will depend on your needs, budget, and preference. The manual massager resembles a cane and does not need any power source to work. They have pressure point knobs designed to reach the actual area you are having a problem. The most common are those that use plugin and batteries to work. Can massagers really replace a masseuse? While there is no device as good as a professional therapist, investing on a decent shiatsu massage machine may save a considerable amount of cash. You will not need to visit a therapist anymore as you have something that provides the same relief and relaxation you would get from a professional massager. Are there massagers for women only? This is one of the standard misconceptions surrounding massagers you may hear out there. However, the best massager for a man is the best for a woman. Men typically do the heavy lifting and other laborious tasks while women may involve themselves in demanding training routines causing pains and trains to various parts of the body. Do I need to be suffering from a medical condition to get a shiatsu? The simple answer to this question is no. You can get a shiatsu massage just for enjoyment and relaxation. Regular massage can keep ill-health at bay and your body in harmony. Is shiatsu good for pregnant mothers? Yes. This massage method is safe and supportive for expectant mothers. However, check with your gynecologist before anything. Is shiatsu appropriate when in medication? Yes. However, it is essential to let your therapist know about your medication and the condition or illness you are suffering from so that they can advise on the same. Also, consult your doctor before settling on a specific therapy. Is shiatsu any good for those living with an incurable condition? Yes. The message technique manages or moderates the symptoms associated with the condition. Shiatsu enhances your sense of wellbeing and your tolerance level so that you can deal with the situation more easily. Is shiatsu a form of healing? It would be more appropriate to state that shiatsu enhances the healing process rather than a healing by itself. The goal of shiatsu is to help your energy transition into a more stable state providing the best conditions for healing. Is shiatsu of any harm? In general terms, the primary objective of shiatsu is to enhance a balanced flow of energy supportive to your sense of wellbeing. The first few sessions may seem hard as the toxins get into circulation and you experience headaches, diarrhea or stomach upsets. However, this is no cause for worry as the symptoms are just transitory. How will I feel after a session of the massage? Most of the people love the good feeling that accompanies a massage. 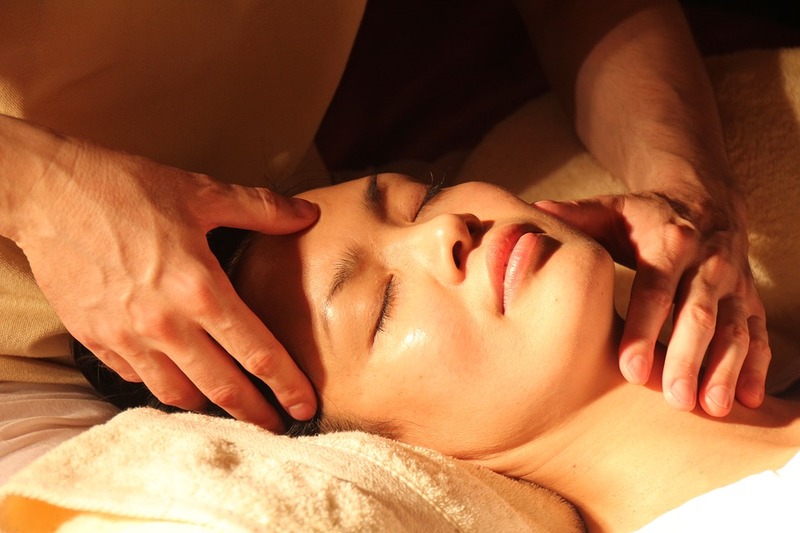 You may feel relaxed and energized following a session of the massage. There are others that may feel tired, especially the starters. However, this feeling is only transitory. Are there any warnings to take note? People living with diabetes should take note of any signs of hypoglycemia – if you don’t know them, you are free to test the blood sugar before and after the session. The relaxed state that a shiatsu massage produces can cause a considerable drop in blood sugar levels. The best shiatsu massager is the one that deals with your needs adequately. It is easy to use, relieves any stress and deals with muscle pain that has been bothering you. All the products in the above shiatsu massager reviews will make decent choices, but this Electric Full Body Shiatsu Massage Chair is the real deal. This massager has all the features that make this a great choice for you. It has top features like kneading, compression, percussion, and flapping. Unlike other massagers that may not deal with specific areas of your body, this chair has features for your buttocks, thighs, and feet.